A bulging disc is one of those odd conditions that can cause no trouble, major trouble, or anything in between. If you have this relatively common, age-related disc deformation, you might go the rest of your life without even being aware of the issue. However, if the disc presses against your nerve roots or spinal cord, the resulting pain and other symptoms will let you know about it right away. Fortunately, you don't have to let a painfully bulging disc or herniated disc get the better of you -- because here at Lubbock Advanced Physical Medicine, we can employ natural, non-surgical techniques to relieve your nerve compression and help the errant disc return to a more normal configuration. Many people are confused about the difference between a bulging disc and a herniated or ruptured disc, partly because the resulting symptoms are so much alike. But a herniated disc never actually bulges or dislocates from its usual position within the spinal column; instead, its outer layer or cartilage ruptures, causing its inner contents to be pushed outward. 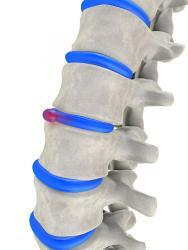 In the case of a bulging disc, the disc remains intact, but part of it actually shifts out of the spinal column. This often occurs as the result of age-related dehydration. As the disc loses its water content, it succumbs to the pressures exerted on it by the surrounding vertebrae and starts to flatten out, causing part of it to jut outward. Major or minor trauma can also produce these changes. Whether your bulging disc presents a serious problem depends on how much pressure it puts on nearby nerve tissue. If you're lucky, the bulge doesn't touch your spinal cord or nerve roots at all, so you experience no symptoms whatsoever. But if the bulge pushes against these important neurological structures, serious nerve impingement may result. This is especially true if you also have bone spurs on the neighboring facet joints, because this can squeeze the spinal cord, a problem known as segmental spinal stenosis. a pinched spinal cord or spinal nerve root can produce all kinds of problems by causing nerve signals to misfire in whichever part of the body that part of the nervous system controls. Symptoms may include shooting or "electric" pain sensations, numbness, tingling, loss of muscle response and other serious issues. If you're intent on resolving your symptoms without surgery or drugs, bring your bulging discs to Lubbock Advanced Physical Medicine. We use sophisticated methods such as non-surgical spinal decompression to alleviate the problems caused by bulging discs. A computer-controlled table imparts just the right degree of distraction force on your spine to create a "vacuum" inside the spinal column. The negative pressure pulls the disc back into its normal position -- relieving your nerve impingement -- while also directing water and nutrients into it. This allows the disc to regain some of its height and heal itself. Schedule an appointment with us today!